HAVE A HEART! - What About Watermelon? You are here: Home / General / HAVE A HEART! 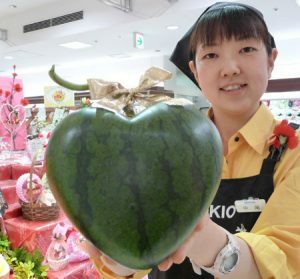 File this one under “awesome” and “I want one now!” Japanese farmers have been experimenting with growing watermelon in shapes other than the traditional round or oblong shapes we’re used to seeing (case in point, the square watermelon and pyramid watermelon). Judging by the photo above, the couple’s hard work paid off beautifully. (I have trouble growing normal-shaped things in my garden!) And here’s the kicker: Unlike the now famous square watermelons, these heart-shaped watermelons are created without the use of forms placed around the fruit to shape it while it grows. Twenty of the creations were shipped to a few Japanese department stores just in time for Mother’s Day last Sunday. The cost: 15,750 yen each. That translates to roughly 162 American dollars. Hopefully, the cost comes down as the Kimuras find a way to mass produce their gardening art! Good success. They are good as gifts for couples dating. these heart shaped watermelon is really looks sweet , the plastic heart shape mold that we offer from http://www.fruitmould.com is hot selling now .